I have always been a fan of very cold winters. I elected to go to Iceland in March one year, specifically because I wanted to see the country in winter, and hopefully see the Northern Lights. While I did see the Northern Lights, they certainly weren’t bright like the pictures. So I did some more research to discover that Fairbanks, Alaska is one of the best places to see the Northern Lights, at least in the United States. 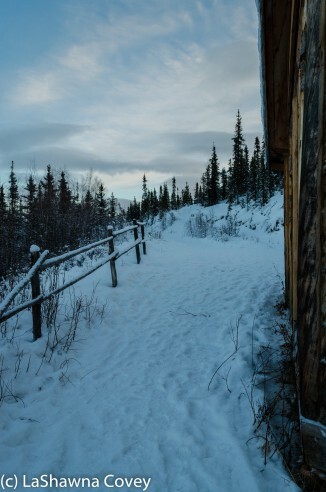 It took me a few years, because I was living overseas for a couple years, but I finally had the opportunity to go up to Fairbanks in January 2015. I figured New Years would be a great time to visit Fairbanks, since it is pretty cold and dark, and would provide a great opportunity to (hopefully, since the auroras can never be predicted) see some beautiful Northern Lights. 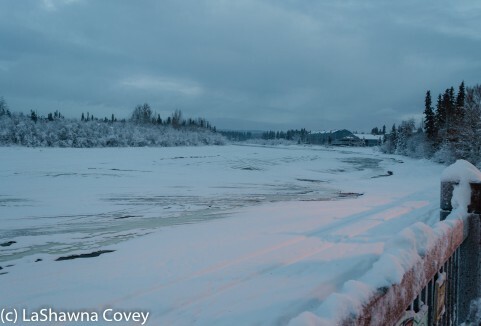 Some quick research of potential places to visit in Fairbanks yielded me Chena Hot Springs Resort. 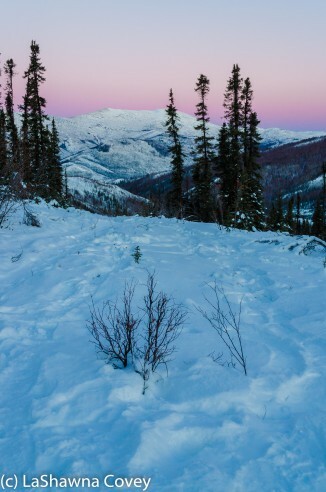 It’s located about 60 miles outside of Fairbanks, basically in the middle of nowhere, and therefore a great opportunity to indulge in some (really) cold winter activities and see some Northern Lights well outside the lights of the city. 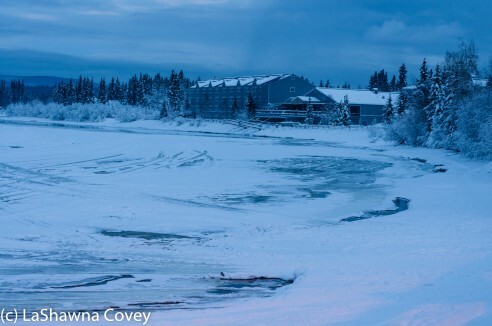 Chena Hot Springs offers up a wide variety of packages, and I selected the four-day Aurora Odyssey package for my mom and me. 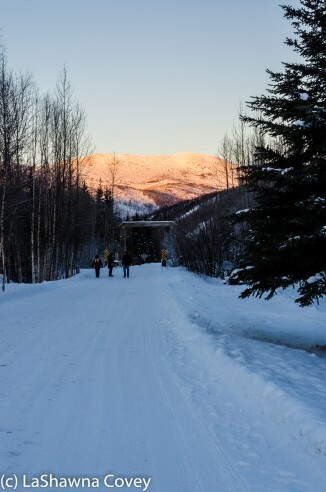 The package offered up a selection of activities, including a night time Aurora Snowcoach tour and a dogsled ride. It was an opportunity to do some things I had never done before in a cold place I had never been before. Due to the timing of flights and the timing of check in at the resort, my mother and I flew into Fairbanks the night before our check in at Chena Hot Springs, and stayed the night at a very comfy lodge, the Pike’s Waterfront Lodge, which is near the airport and right on the Chena River. The next morning we took a shuttle bus to the resort, which is about 90 minutes away from Fairbanks in winter weather. I knew that there wasn’t much daylight in Fairbanks during winter. Reading up on the sunrise and sunset times for Fairbanks, there was officially four hours per day of sunlight when we were visiting. So I expected to spend most of my vacation in darkness, and that appealed to me as well. If I ever get the opportunity, I want to go north of the Arctic Circle in winter time to experience polar night where the sun never rises, just like I experience midnight sun in the summer, when the sun never set. However, what surprised me is how much light there is on either side of sunrise and sunset. It started getting light about two hours before official sunrise and it stayed light about two hours after official sunset. But because of our location, I never actually saw the sun the first four days of our trip. Sure it was sunny and beautiful out most of the days and I enjoyed the brilliant light, but the sun just never rose high enough in the sky to actually see over the mountaintops. For the most part, there are limited scheduled activities at the resort. We had four days out at the resort, and the only scheduled activities we had were the Aurora Snowcoach trip one of the nights, a trip to the Aurora Ice Museum (a follow on blog post) and a dogsled ride. That left a whole lot of time to do whatever we wanted. We both walked around the resort on many of the nature trails. 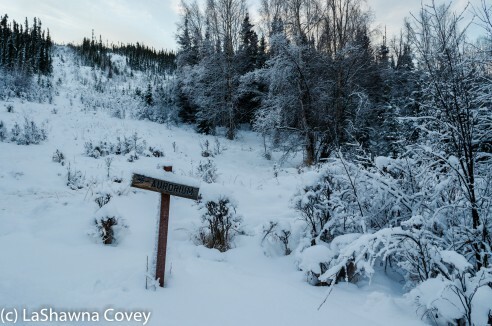 Sure there were inches of snow on the ground, but the resort took the time to ensure walking paths were available and packed the snow down. One morning I got up early (for the area anyway, since I started hiking about 0900, two hours before official sunrise) and did some hiking along the ridge trail. 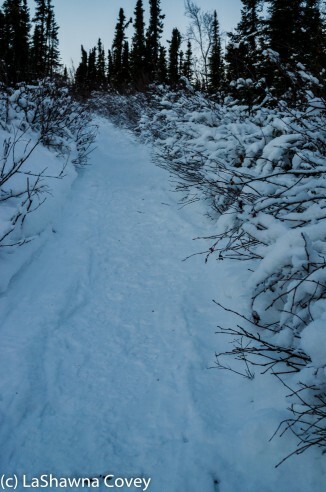 I hiked about one hour up the trail, before deciding to turn around because the snow was a lot more unpacked, deeper and harder to walk in (plus I couldn’t get the thought out of my head that I was being stalked by wolves- which I wasn’t). The view from the trail was very beautiful. The air was clear and cold, the silence and absolute solitude was peaceful, the light was beautiful, changing from the blue of the pre-dawn to a gorgeous salmon light shining on the mountaintops (even though I still couldn’t see the actual sun). 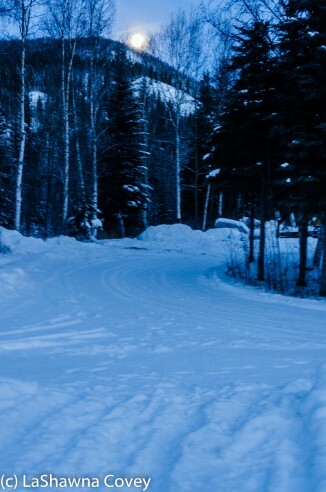 Fairbanks in the winter is also an opportunity to experience some serious cold. 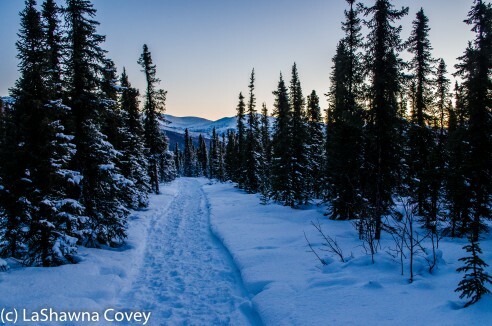 I have experienced single digit temperatures on occasion here and there, but winter in Fairbanks is frequently much, much colder, especially with wind chill. I was looking forward to it, so imagine my surprise and chagrin when we arrived our first night at the temperature was in the low 30s. Yes, the temperature rose to be around 32 degrees so it snowed. 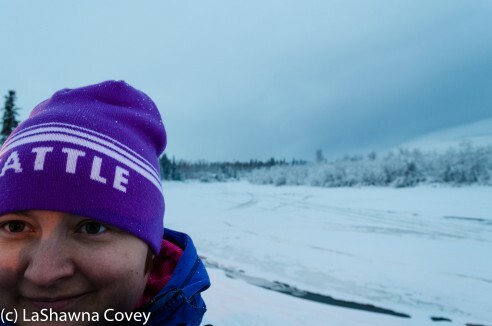 It sounds like it could be cold, but that temperature is basically spring thaw weather, and it was exceedingly out of character for Fairbanks in January. It actually snowed the first day we were there, but thankfully the temperature dropped into the single digits and the sun came out. That also meant clear nights out to see the auroras. The auroras would make their first appearance around 10 pm, but then disappear until around 1-2 am, when they would come dancing out over skies. Our first two nights were cloudy, because it was so warm so no auroras were visible, but the last two nights were dark, clear and cold. On the third night, we got the aurora call from the front desk at 10 pm and bundled up to hike up to the aurorium to see more aurora. I had forgotten to bring a flashlight, but luckily our stay coincided with the full moon, so we had enough light to hike up the hill in the middle of the night. We stayed up until about 12:30 am the third night, but after seeing nothing, and because I assumed we wouldn’t see anything, because the weather wasn’t perfectly clear, we went back to our rooms to sleep. Of course we found out later that day that the auroras came out around 2 am and were so bright, with colors of green, pink and purple. I had to kick myself for not waiting, but the next night we went out on the Aurora Snowcoach tour that took us to a nearby hill out in the middle of nowhere. The aurora schedule mirrored the night before. They were initially out in force around 10 pm as we ascended the mountain. I kept straining my head for a good view, but by the time we reached the top, they had disappeared. The next three hours were filled with cold and disappointment (luckily they had heated tents with hot beverages so we weren’t outside for those three hours), and doubt they would appear. Just because the conditions are right for aurora, there is no guarantee they will actually appear. Of course, shortly before 2 am when we were supposed to come down the mountain, the auroras came out in force and were bright green, dancing overhead with long swirly streaks. While the guides kept trying to usher us back into the snowcoaches, we weren’t having any of that, and stayed as long as we could to enjoy the sights. I deliberately didn’t bring my camera with me, because I wanted to just take in the experience and see the lights, and not have to worry about camera settings or getting the best picture. I just wanted to treasure these memories, with the hope of coming back later to take pictures. I am very glad that I got to see the Northern Lights, though that engendered a desire to see more. I REALLY want to come back to Fairbanks in the winter (preferably around the new moon) to see more auroras. What I learned from this experience is to have patience. Sure there are no guarantees they will appear, but I can’t give up until around 3-4 am. I mean, that is one of the main reasons to come to Chena Hot Springs in the winter anyway, so take full advantage of it and stay up all night. Chances are you won’t be disappointed. This trip was one of the best winter trips I have ever taken. Sure I didn’t see as many auroras as I wanted, but I still did see them. I got some great hiking in, and enjoyed clear, pristine weather in a gorgeous location. 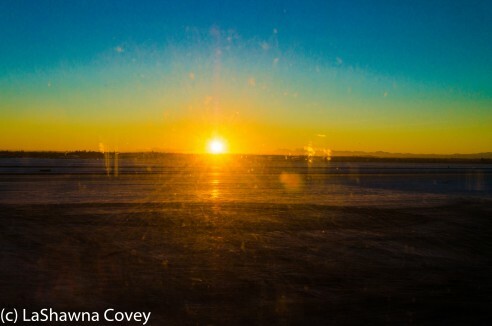 Our final day, when we were at the airport getting ready to leave, I finally saw the actual sun for the first time in several days, as it rose beautifully above the horizon. 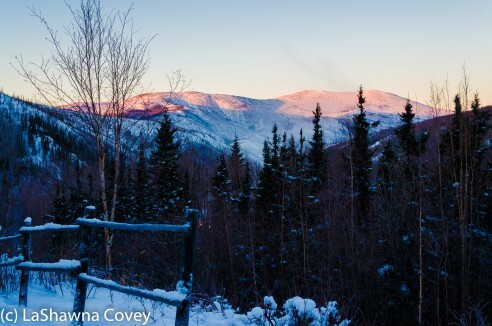 Fairbanks is definitely not a place to be missed if you like cold winter and beautiful nature. 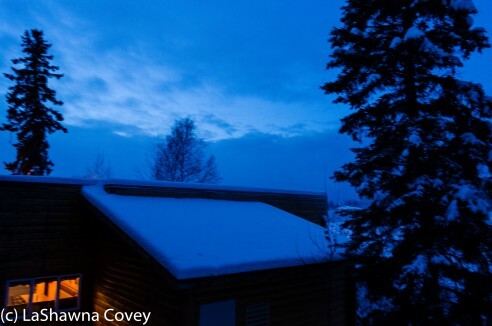 This entry was posted in Photography, Travel and tagged Alaska, Aurora Odyssey, Chena Hot Springs Resort, Fairbanks, Northern Lights, winter.